It’s been over four months since I last posted a real update. I wish I could get them out quicker but as I’ve said in the past, I am reading all these books as I go and that takes some time. I’m also not reading Spider-Man 24/7 and get distracted by bright shiny crossovers like Secret Empire. And when I do sit down to compile and write up the next update, I have to take all my notes and go over things with a fine tooth comb and spend way too much time worrying about the smallest of details that most wouldn’t care about, and that takes time. But also, that I want to get it “right”. Well, as right as it can get because it will never be perfect. And speaking of not perfect, I have to fill in a few gaps before getting to the bulk of this update. First, I have to go way, way back and insert the first two issues of Dazzler. They have to occur “shortly” after she first meets Spider-Man in Amazing Spider-Man 203. The issues are pretty inconsequential, and I wouldn’t worry too much about tracking them down. The first issue isn’t much more than a glorified cameo for Spidey and while he appears throughout issue 2, it is more in the background than anything. Dazzler 1 – Direct reference to Spidey first meeting Dazzler a short time ago in Amazing Spider-Man 203. But doesn’t necessarily have to be immediately after that issue. Not much more than a glorified cameo. Dazzler 2 – Spidey doesn’t have a big role, but does appear throughout. Next up is a set of Morbius issues that should have been included in the last update. Of note, the first two issues feature only Peter Parker cameos, but build upon a story that comes to a head in issues 3 and 4. Morbius – The Living Vampire 01 – Really only a 1 page Peter Parker cameo…can probably skip. Spider-Man cameo in flashback and direct reference to Spider-Man 13. Morbius – The Living Vampire 02 – Mostly a Peter Parker cameo, but seems relevant enough and sets up the next issue. Morbius or full Marvel reading orders would put some issues between 1 and 2, but for our purposes, it’s not really necessary. Marvel Holiday Special 1993 [Spider-Man story only] – Feels out of continuity. At the very least, the continuity is very loose and doesn’t mesh with the recent Electro appearances around the time of release. This placement makes more sense with regards to Electro characterisation. But the winter/Christmas timing doesn’t work. Spider-Man Unlimited 001 [Story 2] – Story 2 – context free battle with the Scorpion. Web of Spider-Man 101 – Maximum Carnage Part 2. Direct reference to and continues almost immediately from Spider-Man Unlimited 1. Amazing Spider-Man 378 – Maximum Carnage Part 3. Some time after part 2. Long enough for Venom to fly from SF to NY. Harry’s death was “days ago”. Direct reference to Spirits Of Venom crossover. Spider-Man 035 – Maximum Carnage Part 4. A short time after part 3. Long enough for MJ to put some clothes on. Direct references to Web of Spider-Man 101, Amazing Spider-Man 316, Amazing Spider-Man 363. Spectacular Spider-Man 201 – Maximum Carnage Part 5. Immediately after Spider-Man 35. Web of Spider-Man 102 – Maximum Carnage Part 6. Continues from Spectacular Spider-Man 201. Direct references to previous parts of the crossover, Amazing Spider-Man 375, Venom: Lethal Protector 1. References Morbius mind controlling Spidey in Morbius – Living Vampire 4, but not directly. Amazing Spider-Man 379 – Maximum Carnage Part 7. Continues from Web of Spider-Man 102. Direct reference to Spectacular Spider-Man 163, Infinity War 2. Spider-Man 036 – Maximum Carnage Part 8. Continues from Amazing Spider-Man 379. Spectacular Spider-Man 202 – Maximum Carnage Part 9. Immediately after and direct reference to Spider-Man 36. Web of Spider-Man 103 – Maximum Carnage Part 10. Continues from and direct reference to Spectacular Spider-Man 202. Direct reference to Amazing Spider-Man 379. Amazing Spider-Man 380 – Maximum Carnage Part 11. Continues from Web of Spider-Man 103. Direct reference to Web of Spider-Man 102. Spider-Man 037 – Maximum Carnage Part 12. Immediately after and direct reference to Amazing Spider-Man 380. Death of Doppleganger. Spectacular Spider-Man 203 – Maximum Carnage Part 13. Immediately after Spider-Man 37. Carrion cured…for now. Spider-Man Unlimited 002 – Story 1 and 2 – Maximum Carnage Part 14. Immediately after Spectacular Spider-Man 203. Story 3 – Context free. Secret Defenders 07 – Immediately after Secret Defenders 6. Secret Defenders 08 – Immediately after Secret Defenders 7. Midnight Sons Unlimited 003 – Direct reference to Maximum Carnage. Infinity Crusade 02 – Immediately after Infinity Crusade 1. Spider-Man has mostly stood around in the background for two issues. Web of Spider-Man 104 – Story 1 – Infinity Crusade crossover. Direct reference to Spider-Man 36. Direct reference to and overlaps Infinity Crusade 1-2. Story 2 – Spawn uh Deathwatch story, no Spider-Man . Web of Spider-Man 105 – Story 1 – Infinite Crusade crossover. Immediately after Web of Spider-Man 104. Editor’s note that it takes place between Infinity Crusade 2-3. Direct reference to Marc Spector: Moon Knight 57. Story 2 – Spawn uh Deathwatch story, no Spider-Man . Infinity Crusade 03 – No Spider-Man. Infinity Crusade 04 – Spider-Man appears in one panel. 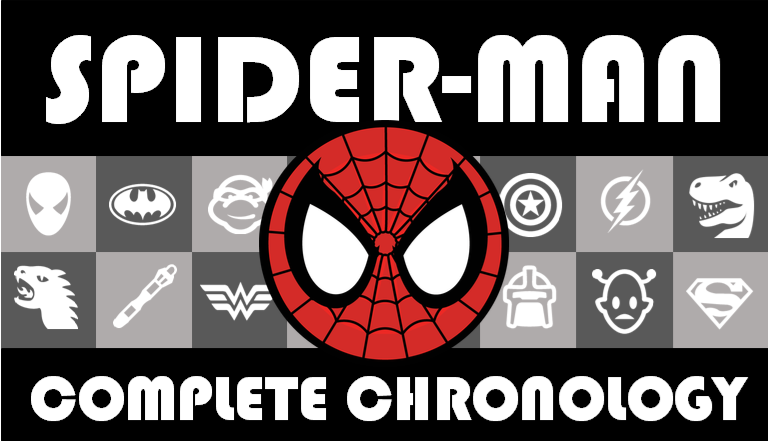 Infinity Crusade 05 – Spider-Man’s appearance is mostly the same as Web of Spider-Man 106. Marc Spector Moon Knight 57 – Infinity Crusade crossover. Direct reference to Infinity Crusade 1-2. Overlaps with Web of Spider-Man 105. Overlaps Infinity Crusade 5. Infinity Crusade 06 – Spider-Man has some very small cameos. Silver Sable and the Wild Pack 17 [Story 2] – Story 2 – essentially a condensed retelling of Amazing Spider-Man 265, 280-281. Continued next issue. Silver Sable and the Wild Pack 18 [Story 2] – Story 2 – continued from last issue. Based on Amazing Spider-Man 281. Amazing Spider-Man 381 – Direct reference to Infinity Crusade and it’s Web of Spider-Man tie-ins. Amazing Spider-Man 382 – Immediately after Amazing Spider-Man 381. Marvel Comics Presents 138 [Spider-Man story only] – Context free. Spider-Man 039 – Continues from Spider-Man 38, but not immediately. The following day. Spider-Man 040 – Immediately after Spider-Man 39. Wonder Man 028 – Context free, but Spider-Man is in LA. Wonder Man 029 – Immediately after Wonder Man 28. Spectacular Spider-Man Annual 13 – Story 1 – direct reference to Spectacular Spider-Man 178, Spectacular Spider-Man 194-196. No Spider-Man. Origin Nocturne. Continues in story 2. Story 2 – direct reference to Spectacular Spider-Man 196. Story 3 – Nocturne again. No Spider-Man. Story 4 – Black Crow, no Spider-Man. Story 5 – Prowler, no Spider-Man. Spider-Man and X-Factor – Shadowgames 02 – Immediately after last issue. Spider-Man and X-Factor – Shadowgames 03 – Continues shortly after last issue. Just wanted to make a couple of notes here for the upcoming section. Spider-Man – The Mutant Agenda was billed as this revolutionary crossover between the Spider-Man newspaper strip and the in-continuity comics. It never quite worked out that way. So you don’t need to hunt down newspapers from 1994 to complete your reading order. Nor do you have to find Spider-Man – The Mutant Agenda #0. The comic features a color reprint of the origin of Spider-Man that appeared in the newspaper strip…and then a bunch of blank pages for you to cut out the newspaper version of The Mutant Agenda and stick them in. The section that begins here and runs through the Lifetheft storyline is a bit of a mess, mainly because of the J Jonah Jameson backup stories in Spectacular Spider-Man, the move of apartments for the Parkers and MJ’s soap opera acting career drying up. Spectacular Spider-Man 205 [Story 1] – Story 1 – immediately after Spectacular Spider-Man 204. Tombstone puts Flash in hospital. Liz tells Peter and MJ she is selling the building and they have 30 days to find somewhere else to live. Spectacular Spider-Man 206 [Story 1] – Can possibly leave 205 and 206 together as they seem to overlap, but the main story continues one to the other, so have them this way. Story 1 – immediately after Spectacular Spider-Man 205 story 1. Spectacular Spider-Man 205 [Story 2] – Story 2 – seems to run concurrently with story 1. Spectacular Spider-Man 206 [Story 2] – Story 2 – Jameson story continues from last issue. Spectacular Spider-Man 207 – Could split this as well to keep the story 1’s and story 2’s together, but story 1 here seems to come before story 2 and after 206 story 2. Story 1 – editor’s note to check up the upcoming Shroud mini-series. Seems to be referencing back up stories in Spectacular Spider-Man 205-206. The scene with Marla and John Jameson doesn’t seem to make any sense unless it occurs between the backup stories in Spectacular Spider-Man 205-207. Story 2 – Jameson story part 3, but sounds like it is after main story. And is definitely before story 1 in 208. Spectacular Spider-Man 208 [Story 1] – Story 1 – immediately after the main story in 207. Web of Spider-Man 107 – Story 1 – Infinity Crusade mentioned (since it was last issue). Jonah’s attitude about making the Bugle respectable seems to be after the back up story in Spectacular Spider-Man 205-207. Story 2 – Cardiac story, no Spider-Man. Web of Spider-Man 108 – Story 1 – immediately after Web of Spider-Man 107 story 1. Editor’s note that this is before Amazing Spider-Man 385. Story 2 – Cardiac story, no Spider-Man. Amazing Spider-Man 383 – Direct reference and has to be after Liz tells the Parkers they have to move in Spectacular Spider-Man 205. MJ is apartment hunting here, but they already have a place lined up for a week later as of Spectacular Spider-Man 206. Amazing Spider-Man 384 – Continues from Amazing Spider-Man 383. MJ’s role on Secret Hospital downgraded to recurring. I guess this is different/worse than her role already being reduced since that has been going on for awhile. Amazing Spider-Man 385 – Immediately after Amazing Spider-Man 384. Direct reference to Spectacular Spider-Man 204 about Liz selling their apartment. MJ quits smoking. Spectacular Spider-Man 208 [Story 2] – Story 2 – Peter and MJ move into new place. Peter’s folks help with the move. Spectacular Spider-Man 209 [Story 1] – Story 1 – Should be shortly after the main story in Spectacular Spider-Man 208. Story 2 in 208 might be ok in between. Direct reference to Web of Spider-Man 91-92. Spectacular Spider-Man 210 [Story 1] – Story 1 – immediately after Spectacular Spider-Man 209 story 1. Spectacular Spider-Man 209 [Story 2] – Story 2 – Flash is still in hospital. Felicia asks him to marry her. Spectacular Spider-Man 210 [Story 2] – Story 2 – Black Cat and Flash break up. Flash gets out of hospital. Web of Spider-Man 109 – Story 1 – pretty context free. Story 2 – after Peter and MJ have moved into their new place. Story 3 – return of the Lizard. Death of Calypso? Lethal Foes of Spider-Man 01 – Direct reference to Spider-Man 18-23 being “a few months past”. Has to be after Designer Genes. Lethal Foes of Spider-Man 02 – Hours after part 1. Lethal Foes of Spider-Man 03 – Continues from part 2. Lethal Foes of Spider-Man 04 – Immediately after last issue. Direct reference to Spider-Man Unlimited 3 which should be after this issue. Spider-Man Unlimited 003 – Story 1 – Doc Ock story referenced in Lethal Foes Of Spider-Man 4. Story 2 – Corona story. Mostly context free but direct reference to and has to be after Spectacular Spider-Man 176-177. Story 3 – Annex story. No Spider-Man. Spider-Man 042 – Immediately after Spider-Man 41. Spider-Man 043 – Immediately after Spider-Man 42. Thunderstrike 05 – Immediately after Thunderstrike 4. Thunderstrike 06 – Immediately after Thunderstrike 5. Spidey takes off on page 16. Spider-Man – Web of Doom 01 – Editor’s note that this takes place before Amazing Spider-Man 388. MJ has gone on location for 6 weeks shooting a movie, so one assumes she is done with the soap? Appears to be after they’ve moved as issue 2 has MJ talking about paying their mortgage. Spider-Man Unlimited 004 – Story 1 – I would guess after Peter and MJ have moved, which was in Spectacular Spider-Man 208. Jonah is clearly at the Bugle. Story 2 – direct reference to Web of Spider-Man 81. Has to be after MJ has left sopa opera job. Story 3 – context free but awful. Amazing Spider-Man Annual 1994 (#28) – Story 1 – vs Carnage. Context free outside of being after Maximum Carnage. Story 2 – Cloak and Dagger. No Spider-Man. Story 3 – Just a Guy Named Joe. Spider-Man only in flashback to original story. Story 4 – Rhino story, no Spider-Man. Amazing Spider-Man 386 – Lifetheft Part 1. Peter and MJ are in their new apartment. Amazing Spider-Man 382 was “a few days ago”, not that it matters. MJ is attacked by a fan at a publicity event…for Secret Hospital. Amazing Spider-Man 387 – Lifetheft Part 2. Immediately after Amazing Spider-Man 386. Peter reveals identity to his “parents”. Web of Spider-Man 110 – After Peter and MJ have moved. Seems to be before back up stories in Spectacular Spider-Man where Marla is looking for a divorce, though the two books seem to be generally ignoring each other in this regard. Direct references to being after Amazing Spider-Man 385 and Amazing Spider-Man 386. Has to be after MJ is attacked and before Peter finds out truth about his parents. Web of Spider-Man 111 – Morning after Web of Spider-Man 110. Likely nothing in between. Spider-Man 044 – Basically context free. Should be before Amazing Spider-Man 388. Amazing Spider-Man 388 – Story 1 – Lefttheft Part 3. It’s not immediately after Amazing Spider-Man 387, but not a lot of time has passed. Editor’s note that Spider-Man 45 is next. Story 2 – Flashback story to tell the events of Web of Spider-Man 18 and 24 from Venom’s perspective. No reason to move this closer to them, especially since it would be well before Venom is even revealed. Direct reference to the Venom back up story in the 1992 Spider-Man annuals. Story 3 – Cardiac and Chance, no Spider-Man. Spider-Man 045 – Pursuit Part 1. Supposedly minutes after Amazing Spider-Man 388, but seems to overlap the ending. Spectacular Spider-Man 211 – Pursuit Part 2. Web of Spider-Man 112 – Pursuit Part 3. Direct reference to and has to be before Web of Spider-Man Annual 10. There’s an implication that Web of Spider-Man 111 was “last night” but I think we can ignore that. Amazing Spider-Man 389 – Pursuit Part 4. Pretty much immediately after Web of Spider-Man 112. Spectacular Spider-Man 212 – After Pursuit. Spider-Man Unlimited 005 – Story 1 – after move to brownstone. MJ is done with the soap opera. Story 2- context free. Story 3 – no Spider-Man. The Shroud 01 – Direct reference to Spectacular Spider-Man 207-208. The Shroud 02 – Immediately after Shroud 1. No Spider-Man after page 6. The Shroud 03 – No Spider-Man. The Shroud 04 – Implies that this is after Lifetheft (and likely Pursuit). Editor’s note to check out this years Spectacular Spider-Man Annual, so should be before that. Spider-Man Unlimited 006 [Story 2] – Story 2 – editor’s note that this story takes place before Amazing Spider-Man 390. And it takes place in Chicago. Spider-Man Unlimited 006 [Story 3] – Story 3 – Flash Thompson story. Direct reference and has to be after Spectacular Spider-Man 210. Flash and Peter are friends again, which seems odd so soon after his “we’re not really friends” speech in Spectacular Spider-Man 207. Web of Spider-Man Annual 10 (1994) – Story 1 – has to be after Web of Spider-Man 112. Direct reference to and has to be before Amazing Spider-Man 390. Story 2 – Warrant, no Spider-Man. Story 3- Black Cat and Black Fox. No Spider-Man. Editor’s note that this is before solo Black Cat, mini-series. Story 4 – Prowler, no Spider-Man. Spectacular Spider-Man 214 – Continues from last issue, but not immediately. After John Jameson takes over as head of security at Ravencroft. Felicia Hardy – The Black Cat 01 – Direct reference and has to be after Spectacular Spider-Man 210. Spider-Man also appears in issue 4, but it’s mostly inconsequential and since he doesn’t appear in issues 2 and 3 I’ve flagged it as a cameo instead. Spectacular Spider-Man Annual 14 – Story 1 – has to be after Lifetheft and Pursuit. Story 2 – Foreigner. After Spectacular Spider-Man 209-210. Spider-Man only appears in one panel in flashback. Story 3 -Shroud. No Spider-Man. The Prowler 01 – Spider-Man appearance is minor and context free. Spider-Man – The Arachnis Project 01 – Direct reference to Amazing Spider-Man 383-385. Really odd feel from a continuity perspective. No mention of MJ. Aunt May is mentioned, but not that she’s sick. Spider-Man goes to Washington. Constantly worries about money, which feels more old school. Spider-Man – The Arachnis Project 02 – Immediately after last issue. Direct references to Amazing Spider-Man 385 and Web of Spider-Man 112. Spider-Man – The Arachnis Project 03 – Immediately after last issue. Spider-Man – The Arachnis Project 04 – Pretty much immediately after last issue. Spider-Man – The Arachnis Project 05 – Immediately after last issue. Spider-Man – The Arachnis Project 06 – Immediately after last issue. Clandestine v1 006 – Spidey really only has a 2 page cameo. Clandestine v1 007 – Enough Spidey to include, and if so, likely have to include #6. Completely context free, but probably before the whole “I am Spider” faze. Morbius – The Living Vampire 21 – Has to be after Lifetheft, probably Pursuit. Morbius – The Living Vampire 22 – Immediately after Morbius – The Living Vampire 21. Morbius – The Living Vampire 23 – Immediately after Morbius – The Living Vampire 22. We’re getting into a section that nowadays Marvel would dub “Road To The Clone Saga”. There is a running subplot here of a mystery man who has been in contact with Aunt May and when he finds out she is ill, races across the country to see her. Of course, we all know this is Ben Reilly, clone of Peter Parker. While the order of the Reilly appearances seems to be correct…massaging in the rest of the issues around those cameos turned out to be quite challenging. I apologize for this section having issues much more split up then I generally like to do. Spider-Man 047 – Could be some time between 46 and 47, but nothing big. Lance Bannon appears so has to be before Web of Spider-Man 114. Spider-Man 048 [P1-P4] – Immediately after last issue. There is a “3 days later” break after Hobgoblin in Russia. Web of Spider-Man 114 – Web of Spider-Man 113 was the previous night. Death Lance Bannon. Direct reference to Amazing Spider-Man 386-388. 1st Ben Reilly cameo, chatting with May on the phone. Amazing Spider-Man 390 – before May’s stroke. Amazing Spider-Man 391 – Continues from last issue and before May’s stroke. Same night as Amazing Spider-Man 390. Direct reference and has to be after Web of Spider-Man Annual 10. May says MJ lost her job. MJ finding Aunt May after her stroke is a bit more elaborated on here and more in story flow than the same sequence in Web of Spider-Man 115. Amazing Spider-Man 392 [P1-P17] – immediately after Amazing Spider-Man 391. Peter finds out about May. Spider-Man 048 [P5-P22] – Direct reference to something happening to May in Amazing Spider-Man 391. Death Demogoblin. Ben Reilly cameo, as he again calls May’s house. MJ answers phone, but he says nothing. Web of Spider-Man 115 [P10-22] – Another Ben Reilly cameo, as he finds out about May being in hospital. Direct reference to Spider-Man 49 for more on him. See letters column for suggested reading order of Ben Reilly cameos. Web of Spider-Man 116 [P1-P4] – immediately after Web of Spider-Man 115. Spider-Man 049 – Peter says he “can’t bring himself to talk to Mary Jane”. Sure sounds like it is before she leaves in Amazing Spider-Man 393. But is after Aunt May has her stroke. Ben Reilly cameo shows him leaving and heading back to NY. Direct reference that his story is continued in Spectacular Spider-Man 215. Web of Spider-Man 116 [P5-P18] – Lance Bannon funeral. Peter talks about Aunt May’s condition, so has to be after Amazing Spider-Man 392. Solo 01 – Direct reference to and has to be after the back up story in Amazing Spider-Man Annual 27. Spider-Man appearance pretty context free outside of reference to him not being so friendly anymore given the goings on in his monthly books. Solo 04 – Immediately after Solo 3. Spectacular Spider-Man 215 – Direct reference to Amazing Spider-Man 392 as Peter knows about May’s condition. Seems to be before MJ leaves. Direct reference to and has to be after Shroud mini-series. Spider-Man “attacks” a civilian. Web of Spider-Man 116 [P19-P22] – Ben Reilly attempts to visit May in hospital. Peter still can’t face MJ and May. Amazing Spider-Man 392 [P18-P23] – Spidey cocoons himself and Peter “dies”. Amazing Spider-Man 393 [P1-P20] – Immediately after Amazing Spider-Man 392. Ben Reilly in town and visits Gwen’s grave. Direct reference to Ben Reilly story continuing in Spider-Man 50. Spider-Man 050 – Story 1 – prior to MJ leaving? After “Peter no more”. Ben Reilly stops by May’s house, Peter almost sees him. Peter has Miles Warren’s journal at May’s house for some reason. First real clue about the upcoming clone saga. Story 2 – Kraven and Grim Hunter flashback story. Amazing Spider-Man 393 [P21-22] – MJ leaves. Annex 01 – Direct reference to Amazing Spider-Man Annual 27. Spider-Man only appears in the first half dozen or so pages. Annex 02 – No Spider-Man. Annex 03 – Spider-Man’s role is small, but sets up next issue. Direct reference to Spectacular Spider-Man 215-216, and has to be after at least 215. Direct reference to Spider-Man 41-43, Spider-Man Unlimited 3, Amazing Spider-Man Annual 27. Annex 04 – Continues from last issue. Spider-Man Unlimited 006 [Story 1] – Story 1 – direct reference to and has to be after Spectacular Spider-Man 215, Thunderstrike 4-6 and before Spectacular Spider-Man 216. Spectacular Spider-Man 216 – Nick Katzenberg dies (off panel). Ben Reilly visits May in hospital. Spidey is vindicated so Spider-Man Unlimited story needs to come before this. Ben Reilly’s face is finally revealed and he comes face to face with Spider-Man. And that brings us up to probably the most controversial and convoluted period in the history of Spider-Man. The proposed 6 issue mini-series that lasted over two years. This should be…”fun”. In the future maybe I will include less issues per update to get them out sooner. Time will tell. As usual, you can find the entire chronology to date on the main menu under Special Features->Jimmy Impossible’s Tasks.